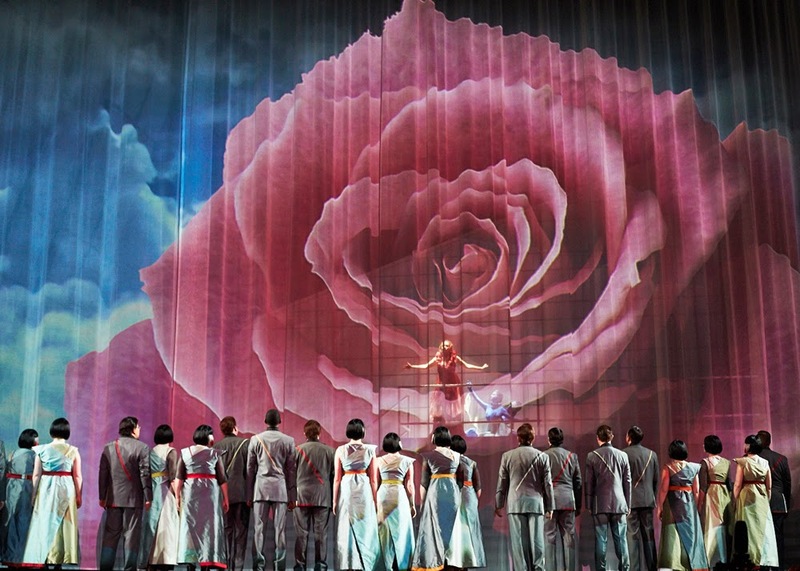 Erhard Rom’s set design for Semele prominently features splendid projections which help tell the story of the opera. 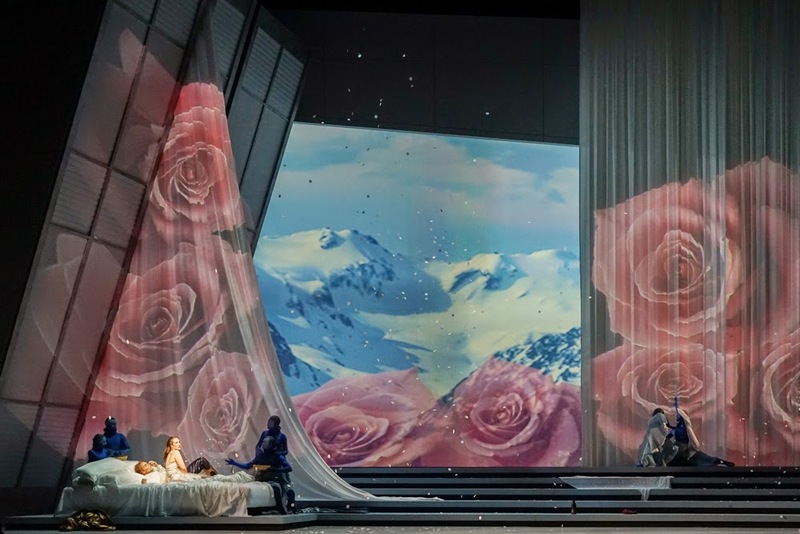 A native son of Seattle, Rom made his design debut at Seattle Opera with our 2013 La bohème, also distinguished by the skillful use of projections. He was kind enough to give us some behind-the-scenes insights into his Semele set design. Opera News loved this image, which we see at the end of Act 1, when Semele sings “Endless pleasure.” How did you decide on this idea? 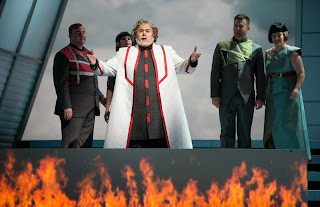 Jupiter’s blue attendants give Semele a new costume element, a rosy dressing-gown, at this moment in the show; did you and costume designer Vita Tzykun develop the idea for set and costume collaboratively? 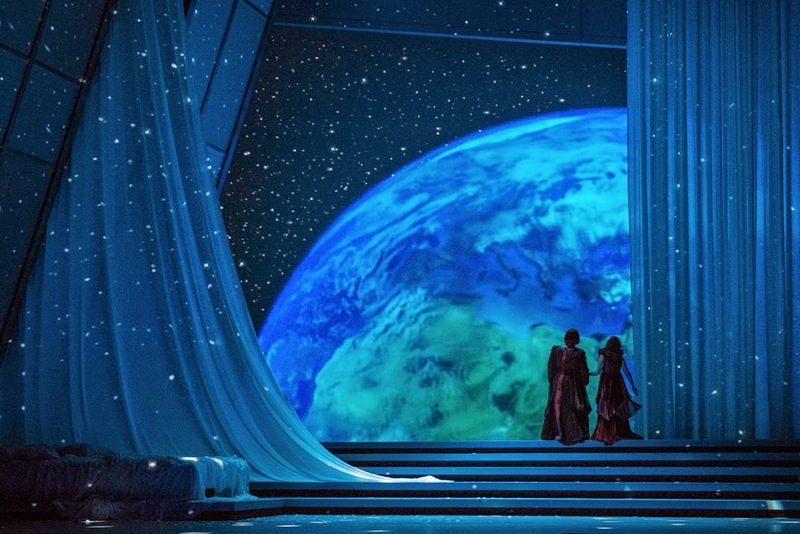 We wanted the chorus to be able to observe Semele while keeping them separated from her new-found world with Jupiter. I remember I came up with the huge rose while I was working with my rough model and it just felt right. [Director] Tomer [Zvulun] and Vita loved it and they then made sure the costume matched the projection. 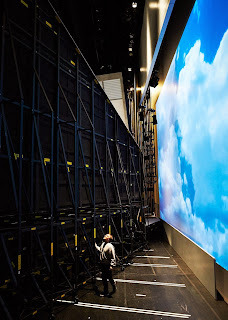 David Hult, Seattle Opera’s Assistant Electrician, works on lighting cues during a rehearsal. 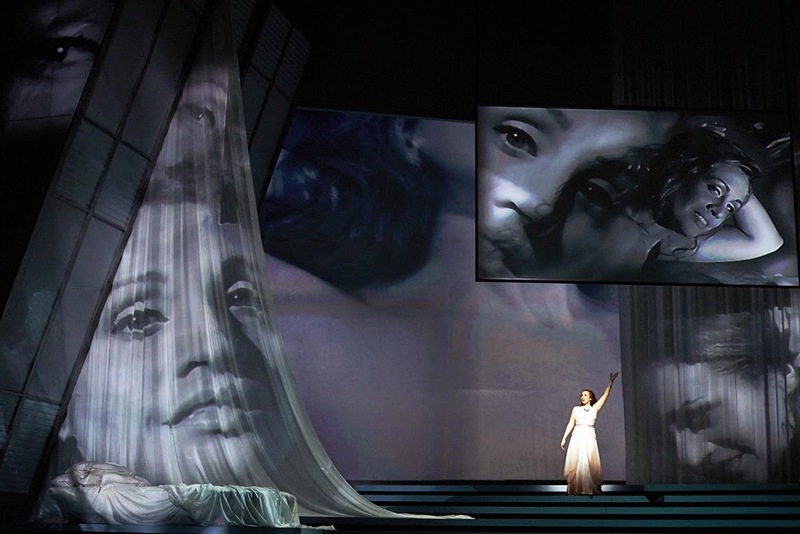 What role does the lighting designer—in the case of Semele, Robert Wierzel—play in the development of the projections? Robert Wierzel is a brilliant lighting designer and extremely skilled at working with projections. He is able to see where the projection is going and works the lighting into the vision so that it feels like one coherent idea. I am specifically referring to color and composition. The projections really have to lead. 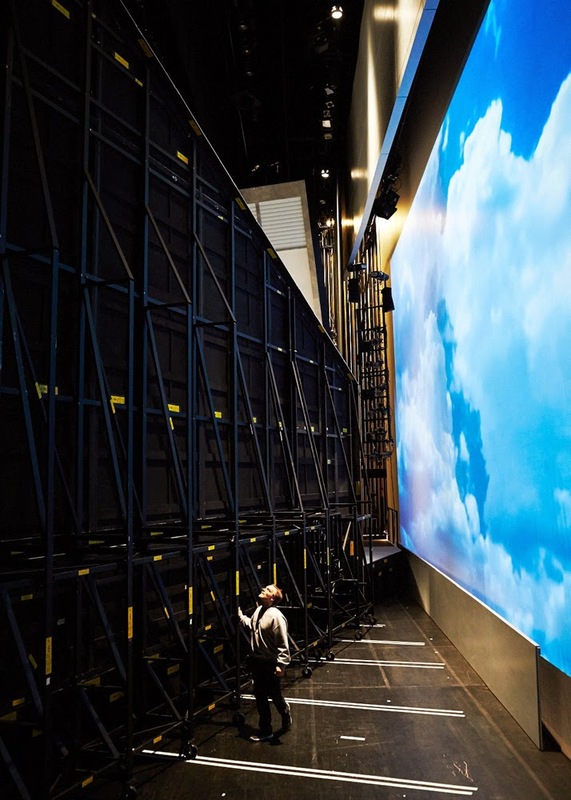 Some lighting designers fight projections, but Robert embraces them. Zooming in a bit closer on the end of Act 2. Audiences have been flabbergasted by the spinning cosmos and the revolving earth here, paired with that breathtaking duet and overwhelming chorus. Can you explain a bit about how the projections work? When a projection involves animation, as these do, is that much more complicated? This sequence was a true delight as it was really a matter of listening to the music and responding with visual ideas. You have to let your imagination go wild. I am very interested in something I call cinematic live theater. With new technologies at hand, it is now possible to bring things into live theater that in the past had been reserved to film. The 3D rendering of the earth, which Chris Reay, Seattle Opera’s Assistant Technical Director, created from flat images of the earth I provided, is one of the many tools we now have that can create magic on stage that one could only dream of in the past. It does take time to create this sort of content. For Semele’s final scene you’re projecting an image of Bacchus, whose birth is celebrated at the end. Where did you find that particular Bacchus image? I wanted to an instantly recognizable, iconic image of Bacchus, so I looked through many sources. Hundreds of well-known (and lesser-known!) artists have rendered the face of Bacchus and I settled on this one because it is simple and clear. We wanted the audience to understand immediately, and I think the grapes make his identity abundantly obvious. Also, tell us about the lovely warm glow you and Robert have given us here: are there lights very close to those big translucent panels on the sloping wall? Robert put lighting instruments into the side wall to get that amber glow. The final scene is almost entirely done with stage light and very little projection. The only projected image is Bacchus, up on the small screen. We wanted the warm glow for the final scene because it symbolizes the glow of the fire and it is also something which is never seen up until that point. Originally we were talking about real flames, but early on in the process the brilliant Seattle Opera technical department suggested we use a projection. So Chris [Reay] and I decided to dedicate one projector exclusively to that fire pit. It’s closer, so the brightness is maximized. If someone were to bump it, we’d be in trouble! But I don’t expect that will happen since it is secured. Nice view here from Semele’s hidden love-bower! For this scene, what’s the advantage of using projection instead of a painted drop? Yes, you see Mount Olympus, in Greece, from the bedroom. The clouds move, and later on the moon comes through the clouds for Jupiter’s’ beautiful aria, “Where’er you walk”. And then the projection dissolves into stars for the duet. None of that would be possible if it were simply a painted drop. “How engaging, how endearing is a lover’s pain and care!” How are you able to project roses on one surface and a mountain on another? What we are seeing here is both front projection and rear projection at the same time. 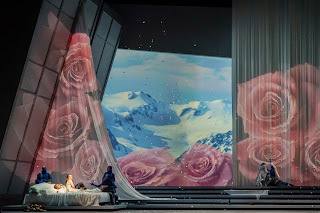 The roses and the mountains in the back are coming from a bank of projectors which fill the rear projection surface. The front-of-house projector is shining on all of the drapery. Masks are put into the front projector to keep the content from spilling onto surfaces we don’t want to hit. In the case of Semele, the projections are considered part of the scenic design. You also designed the built pieces, such as the big wall that’s being rolled on in this photo. What’s the advantage to having one artist design both architectural and digital imagery? Are there advantages to bringing in multiple artists? It all depends on the project. In this case, I imagined the architectural space and the projected imagery simultaneously. The projected imagery was as important as the architecture; each contribute about 50% in terms of the environment in this production. I did both, because there would have been no reason to ask someone else to try to guess what I already had in my head. 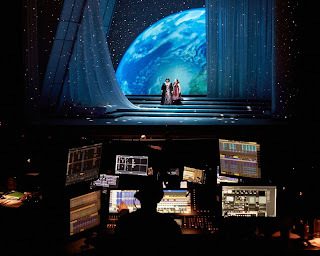 But I think it is important to have a separate projection designer when the projections are simply too much to handle in conjunction with the set design; if the projections become more like 85%, a separate person would be desirable. 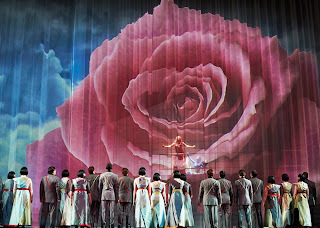 However, I prefer a more balanced version of sets and projections because I believe in live theater that is cinematic. When projections take over completely, I wonder why I am not in the movie theater. 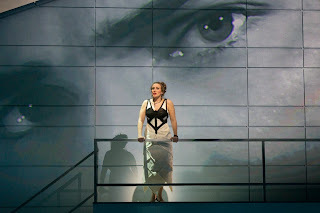 The giant gaze of Jupiter (Alek Shrader) is keeping an eye on Semele (Brenda Rae)—she better not marry that dorky prince! 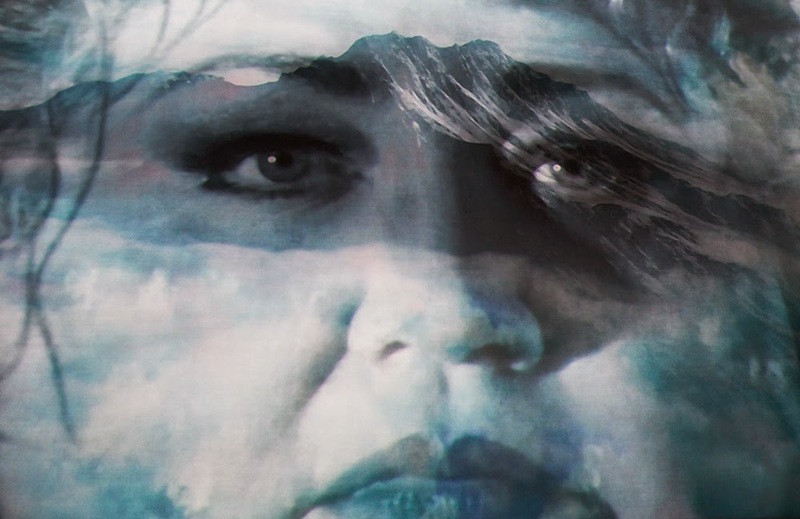 How do the singers rehearse their interactions with projections, which they might not see until late in the rehearsal process? It’s tricky! They can look at model photos which actually do indicate many of the ideas. But that huge eye on the wall was something I thought of after the model was completed, so there was no real reference. At least they saw it in the final rehearsal. Here’s another projection involving our easy-on-the-eyes tenor, Alek Shrader, as Jupiter. 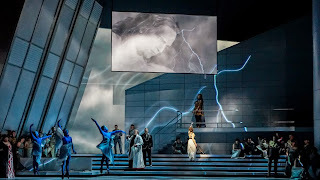 In this scene he’s interrupting Semele’s wedding with thunder and lightning. How do you organize projected images of cast members? Photographing the actual singers was a huge project. We all gathered in Seattle for photo sessions organized by Seattle Opera, who hired professional models to pose for hundreds of photos which I then went through and selected. Once we knew which poses we needed, the actual singers (both casts!) were then asked to imitate those pose, new photos were taken, and I then manipulated those into the images you see onstage. 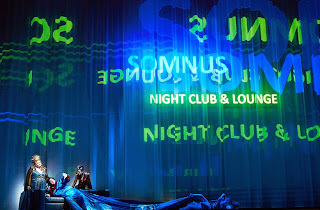 Iris (Amanda Forsythe) is describing the fierce dragons who guard Semele’s abode, and tickling their projected image with the lasers shooting from her fingertips. How did you develop these dragons? And how did the finger-laser idea evolve? The finger-laser idea was something I believe Vita developed with Tomer a bit later on in the process. The shadows are actually the same model in two short video clips we shot in November with a model who posed as a bouncer. 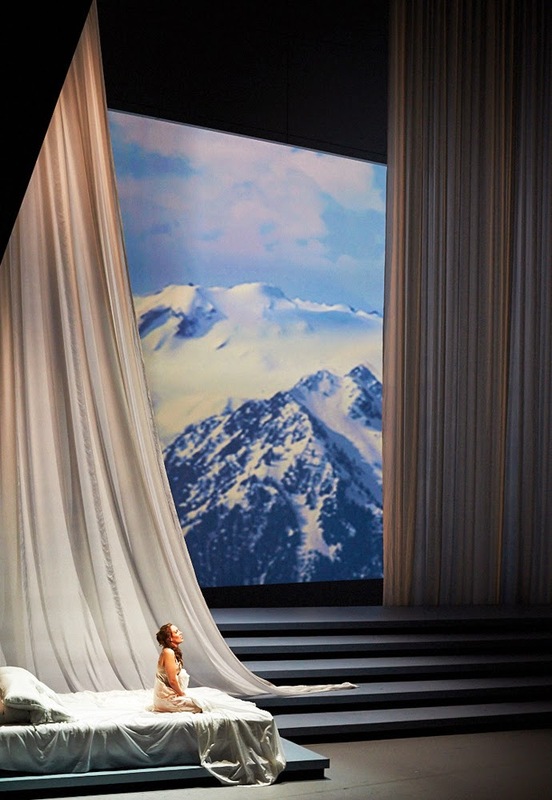 At the top of Act 2, a snowy mountainside turns into the gaze of Stephanie Blythe, whom we’ll see in a moment as Juno. Which mountain is that, and how did this sequence develop? Mount Olympus once again. I came up with this idea while listening to the opening music of Act II, which is very agitated. The music here could either be a description of Iris rushing back to Juno, or (I thought) descriptive of Juno’s raging jealousy. Your team also came up with a creative solution for Somnus’ “Cave of Sleep” location. How did this idea evolve? This was one of the earliest ideas we had, when Tomer, Vita, and I first sat around discussing ideas for the piece. 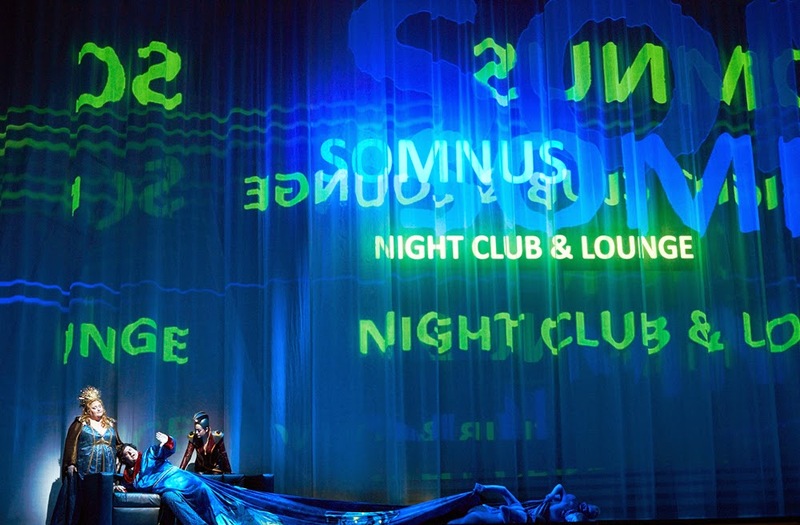 Once we were all looking at a “modern mythic” landscape, we decided that Somnus, with his magic drugs and slumbering entourage, would transport perfectly to a modern night club. For the long Act 3 aria “Myself I shall adore,” Brenda Rae has many selves she can adore. At one point, I seem to remember, there was a plan to morph these images in grotesque ways, in order to horrify her. Did you try out and then discard that idea? Actually I did create a distorted version of her face which I was planning to use. When I watched the final rehearsal, I saw Brenda Rae trying to look shocked and horrified at seeing an image which had suddenly turned grotesque halfway through the aria. My problem was, the music didn’t reflect that feeling. The music is bubbling with cheerful hysteria throughout. So Tomer and I decided that not to use that idea, as it was unsupported by the music. 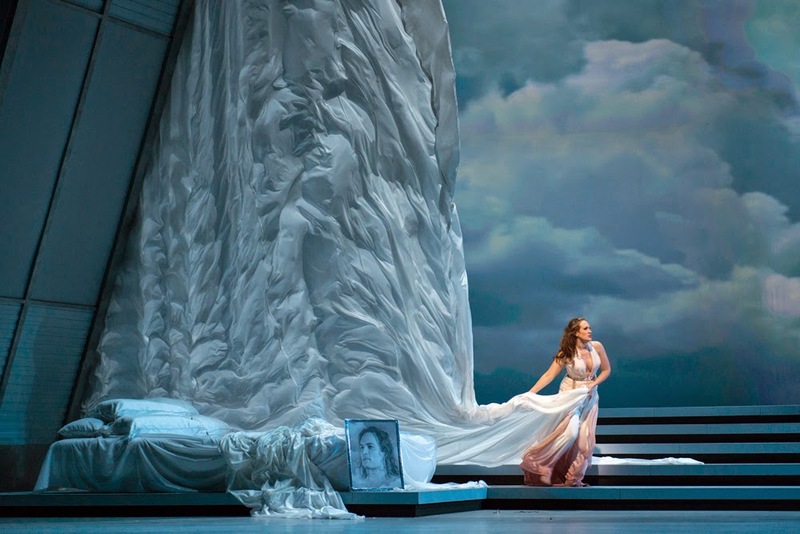 One of my favorite moments comes when Semele rips down the curtain in the palace Jupiter has created for her, during the wild aria, “No, no, I’ll take no less!” Between the turbulent clouds on the screen and the billowing descent of that big sheet, it’s a masterful coup de théâtre. Had you ever made an effect like this before? I’m glad you like that moment! It is one of my favorite parts as well. I did, in fact, use a similar idea before many years ago in a production of Shakespeare’s Romeo and Juliet where at one point Romeo ripped down a large piece of fabric similar to this one.